Though firmly set in 1880s Paris, Maupassant's gripping story of an amoral journalist on the make could, with only slight modifications of detail, be updated to the 1960s, to the Reagan-Thatcher years, or maybe to the present day. Anti-hero Georges Duroy is a down-at-heel ex-soldier of no particular talent. Good-looking but somewhat lacking in self-confidence, he discovers an ability to control and exploit women - whereupon his career in journalism takes off, fuelled by the corruption of colleagues and government arrivistes. He may be a provincial Don Juan, but he is neither accident-prone nor heading for a fall. . . .P> Examining him from head to foot, she cried: "How you have changed! Well; tell me the news." They began to chat at once as if they were old acquaintances, and in five minutes an intimacy, a mutual understanding, was established between those two beings alike in character and kind. Suddenly the young woman said in surprise: "It is astonishing how I feel with you. It seems to me as if I had known you ten years. We shall undoubtedly become good friends; would that please you?" He replied: "Certainly," with a smile more expressive than words. He thought her very bewitching in her pretty gown. When near Mme. Forestier, whose impassive, gracious smile attracted yet held at a distance, and seemed to say: "I like you, yet take care," he felt a desire to cast himself at her feet, or to kiss the hem of her garment. When near Mme. de Marelle, he felt a more passionate desire. This is a really good story and I totally loved it. When you come across fiction that it this good you must stand up and clap. I am clapping. OK now, Chrissie, explain why you loved it. 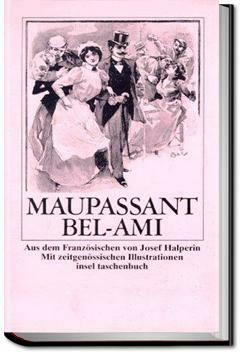 Guy de Maupassant was responsible for a couple of items named Bel-Ami. One was his very successful 1885 novel and the other was his small sailing yacht. Here is what the latter looked like, from a Sale advertisement. Guy de Maupassant's 1885 portrayal of a scoundrel of the highest order, is set in Paris and was written with great style and not a little humour.